We sell Chromalox Heaters at a discount! Call (479) 424-1300 for pricing and delivery information! Chromalox industrial heaters are used to heat gases and liquids, because direct immersion heating is energy efficient and perfect for many different processes. 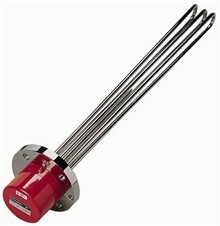 Chromalox immersion heaters apply warmth immediately to the substance being heated. Immersion heaters can be used for many heating applications to heat gases, waters, oils, and other liquid solutions. Chromalox immersion heaters put heat directly into the substance, so they offer 100% efficiency along with energy savings. Call Jobco for help with finding a Chromalox heater for your application by dialing 479-424-1300. A variety of controllers are available to maintain accurate temperature parameters with your immersion heater. There is an immersion heater design available for heating up water, process water, acidic or caustic solvents, thick liquids, oils, or gases. High pressure or anti-explosion immersion heater designs are also available. Chromalox immersion heater engineers can design and build a custom heater to meet your specific project needs. Chromalox immersion heaters are available in these mounting styles: flanged immersion heaters, threaded screwplug immersion heaters, and over-the-side immersion heaters along with threaded, flanged and welded piping options. Chromalox offers a wide variety of stock and assembled stock immersion heaters for speedy shipments to your facility. Call Jobco at 479-424-1300 to order your Chromalox immersion heaters. Click here to download the Chromalox Immersion Heaters Overview Guide. Chromalox screw plug immersion heaters usually have u-shaped tubular heating elements welded to a screw plug. The “dry” end of the screw plug immersion heater usually has a metal housing to protect the electrical connections. The screw plug immersion heaters are attached to a hole in a tank wall that is threaded. Chromalox screw plug heaters are available with these nominal pipe threads: 1/2″ NPT, 3/4″ NPT, 1″ NPT, 1-1/4″ NPT, 2″ NPT and 2-1/2″ NPT. Screw plug immersion heaters can be customized to provide different wattages, voltages, sheath materials, terminal enclosures, and thermostat options. Examples of a screw plug immersion heater application are hot water storage tanks, warming equipment, oil preheating, food processing industry, cleaning tanks, heat transfer systems, process air equipment, boiler heaters, freeze protection for liquids and immersion heaters for tanks. Instruction Guide for the Following Industrial Screw Plug Immersion Heaters ARMT, ARMTO, ARMTS, ARMTI, AREMTI, AREMTO, AREMTS, CH-SD, EMT, EMTI, EMTO, EMTS, E4TP, MT, MTI, MTO, MTS, ARTM, ARTMO, ARTMS & ARTMI. For Chromalox Screw Plug Immersion Heater designs for corrosive liquids, oils, & specialty applications, download this guide. Call Jobco at (479) 424-1300 for your Chromalox Screw Plug Immersion Heater orders, or order by downloading the form below. These Chromalox immersion heaters are frequently used to heat gases, water, oil, heat transfer fluids and corrosive solutions. Flanged immersion heaters are ideal for heating tank and pressurized vessel contents. Flange immersion heaters are simple to assemble and provide an efficient heating method that is easy to control at the desired temperature range of your process. These are just a few of the possible flange heater applications used in the world: hot water immersion tanks, warming equipment, oil preheating, food processing/warming, washing/rinsing tanks, heat transfer systems, process air equipment, boiler heaters, and freeze protection for your liquids. Chromalox flanged immersion heaters usually have u-shaped tubular heating elements brazed into a metal flange with electrical connections. The flange immersion heaters are attached to a mating flange that is welded to the side of a tank or other storage vessel. Chromalox flange heaters are available with many different flange sizes. Depending on your application, flanged heaters can be customized to provide different wattages, voltages, sheath materials, terminal enclosures, and thermostat options.